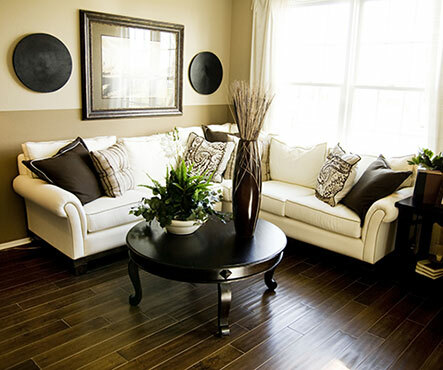 Love the look of wood floors but not the price? With today's engineered laminate floors you can get that look at a fraction of the cost of wood floors. There are many instances where a laminate floor makes more sense (and not just from a cost perspective) as there are advantages to choosing them for different applications. A laminate floor is manufactured in layers. The bottom layer is called "the backing" and it is made to resist moisture and provide a stable base for each piece to prevent warping. The next layer is referred to as the "inner core" which is made of a high density fiberboard that is reinforced with a resin to make it further resistant to moisture. The next layer adds the artistic appeal by simulating a wood floor finish with a high resolution design image that will very accurately mimic real wood flooring, and a final layer is placed on top (the wear layer) to seal the piece and ensure long term durability and resilience to moisture and high traffic wear. Advantages to laminate flooring options include lower VOC emissions as your laminate floor can be installed without glue, which reduces the amount of vapor over time. This is a health advantage that is particularly important to individuals who have respiratory issues, allergies and asthma making laminate flooring the best choice for those homes. Laminate floors are very moisture resistant making them the perfect choice for basements and bathrooms and laundry rooms. They are easy and fast to install on top of any level subflooring, and can be installed with an under pad to further reduce noise in the home. Explore our collection of quality laminate floor options for your home or office. Our staff can help you pick the perfect laminate floor for your application and budget.